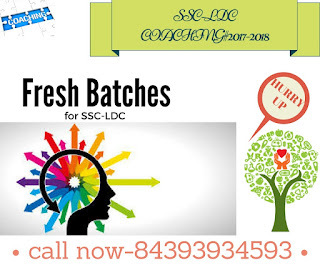 The examination for the post of LDC and DEO are commonly known as Staff Selection Commission’s (SSC) Combined Higher Secondary Level (10+2), in short as SSC CHSL. The examination will consists of a written examination and Skill Test for the post of Data Entry operator and Written Test and Typing Test for the post of Lower Division Clerk on Computer. The Paper will consists of Objective Type Multiple Choice questions and question come in both English and Hindi for Part-I, III and IV. Part I of the question paper contains set of 50 questions of 1 mark each on General Intelligence, Part II will consist 50 question of 1 mark each on English Language(Basic Knowledge), Part III another 50 marks of 1 each on Quantitative Aptitude(Basic Arithmetic Skill and the part IV again comprises 50 marks of 1 mark each on General Awareness. Students need to be highly cautious in answering the questions as there is negative marking of 0.25 marks for each wrong answer. Skill Test for Data Entry Operator is prevalent and candidates will be allotted just 15 minutes. The “Data Entry Speed” Skill Test. Candidates need to qualify the prescribed speed on Computer. Typing Test for LDCs is conducted only for those candidates who have qualified successfully the written examination. The typing test is conducted in both English and Hindi and candidates need to specify in the application form prior in which medium he/she wishes to appear for the exam. Regular classroom lectures conducted by teaching faculty members who are experts in their area of specialization. These teachers will cover each section of the syllabus of this exam. Students will be able to increase their typing speed with the help of typing classes conducted by teachers who will teach them the essentials in this area. Regular test both for written exam and typing will be conducted to make students understand their progress level. Revision and doubt clearing sessions will be conducted at the end of each chapter is completed. This highly motivating team of teaching will help you clear this exam at an ease without any anxiety on the very day of exam. careerpowerghaziabad Coaching provides is the best facilities for the preparation of SSC, CTET, Banking, UP Police and UPTET in Ghaziabad.